HEART OF CHARNWOOD: 2012 Round-Up.... and hopes for 2013. On the sewing front, 2012 has been a big year for me, I've learnt sooooo much from blogs and online resources, started my own blog, "met" some fab new people who actually have great senses of humour, and love sewing/quilting like me (so I realise I'm not quite the weirdo I figured I was when I mentioned quilting to some of my "old" friends!! ), and I have made a few things, from quilts, to bags, to pouches (bleurgh, that word) and learnt to crochet. B. Some pouches (bleurgh) for myself, for all my travel (quilting and embroidering) bits and bobs. And for 2013, I have so many things I want to achieve, including a more professional look for my blog, to keep meeting new people both online and in person (the Fat Quarterly Retreat- squeal!! 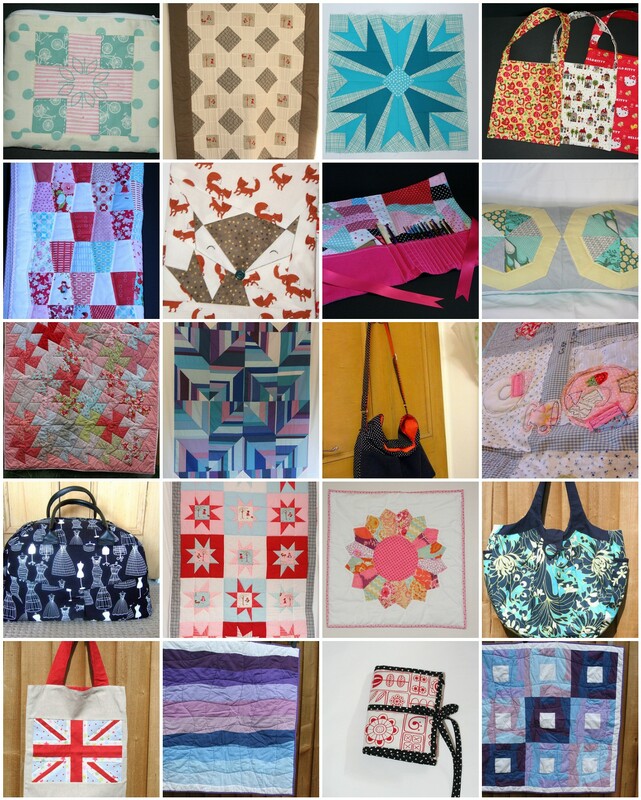 )(and maybe an East Midlands Modern Quilt Guild, extra excited squeal), develop new skills including FMQ, maybe run some kind of swap/bee/or similar (later in the year), and enter my first quilting competition (aaaargh). Great round up of 2012. Can't believe how similar it sounds to my year too. 2013 sounds really exciting. Looking forwardd to hearing about the swap thingumy you are thinking of running. You have achieved masses and you have some great ideas for 2013. I particularly love the look of third row down, second from left - just beautiful. Happy New Year! Wow! You have plans. I just do not have a clue. I am impressed. Hope we meet face to face this year, and I am the same as you in the 'friends' who thought my sewing was just a wee bit weird - though they never said no to a baby quilt!! Making things for yourself sounds like a good plan! It's good to have goals - your use of the word pouches made me giggle as it makes me think of kangaroos...Love your mosaic. Pouches is a bluerggh word...... But flange cushion is worse! I spotted what looks like a hedgehog in the bottom right of your header picture. What can you tell me about that? Is that an applique? I have a son with a sudden peculiar interest in hedgehogs and I'm thinking I may need to produce some hedgehog bits. Thanks and Happy New Year! Okay, we now have something else in common (we hate the word 'pouch' ick! ), friends that think I'm odd for spending my time 'sewing'.